We Just finished up this HUMUNGOUS custom organizer. 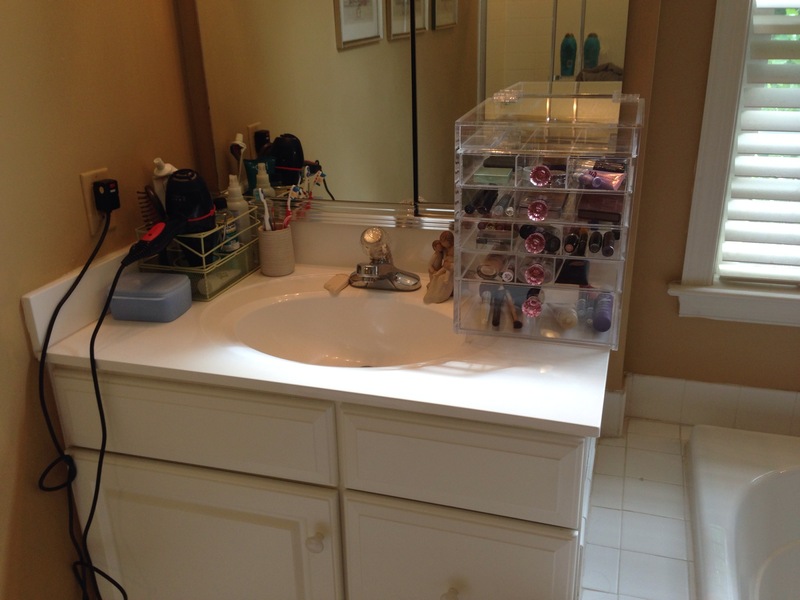 This is an ultra-wide organizer that has one extra drawer than our normal large Cutie Cube. Overall, this has about twice as much storage space as our largest Cutie Cube. We loved the result and so did our customer, so we wanted to share it with you :). As always, be sure to check out our custom organizer page to see all of our past custom orders and to order your own! Check out these great reviews by Ateya and Lovekisses99 on Youtube of our Cutie Cube acrylic makeup organizer! 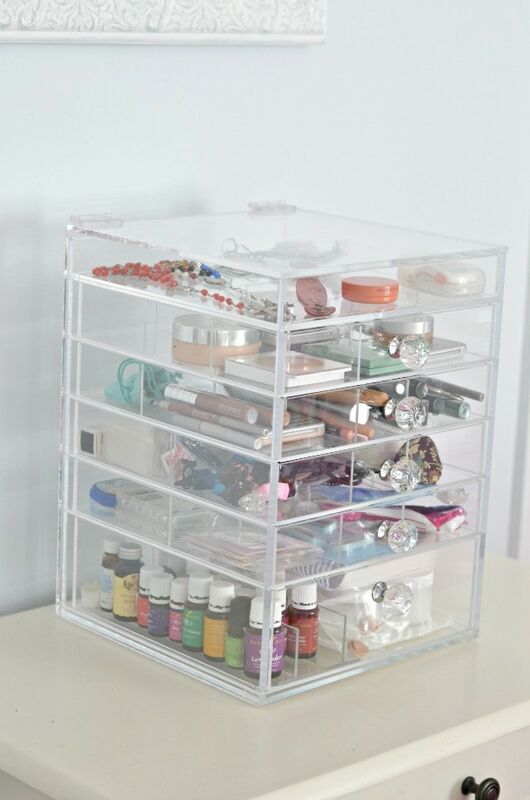 Looking for the Ultimate Make-Up and Beauty Organizer, what about something to store all your jewelry, or somewhere to store all your essential oils or maybe you’re just looking to makeover your medicine cabinet? I did all of the above with the TwinLilies Cutie Cube! 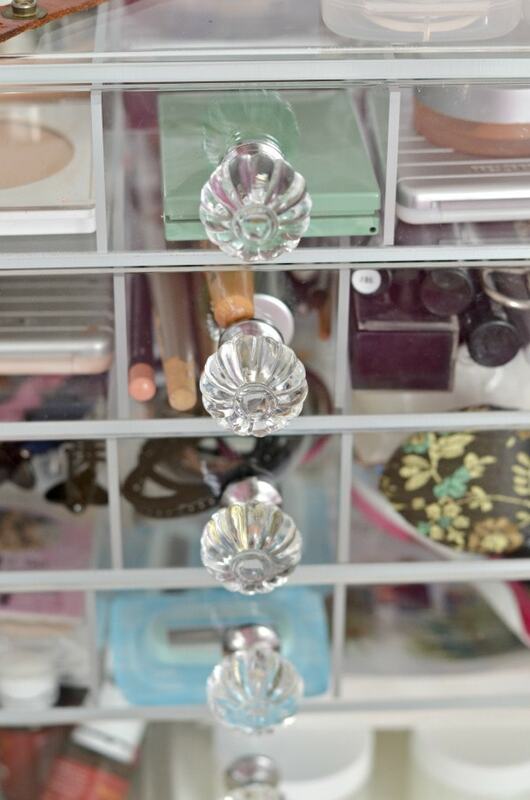 These beautiful acrylic makeup organizers are made for makeup and jewelry. 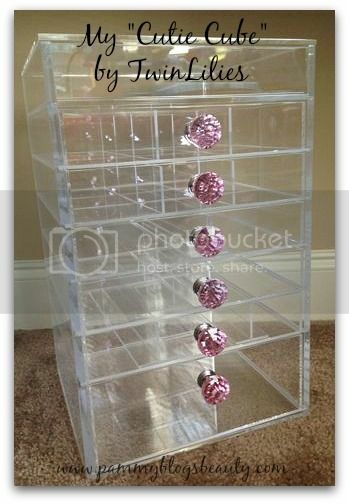 You can display all your stuff in a beautiful clear container with sliding drawers and beautiful jeweled handles. The handles even come in different colors. My favorite is obviously pumpkin!! They have diamonds too! What I really wanted to do in my cabinet was have more space for everything. I had recently went to a store and purchased a bunch of bins and “organized everything. Those bins took up 2 shelves and looked A-MESS. The crazy part, I took all the stuff from said bins and put it all nice and neatly into my cutie cube. It’s extremely customizable and you can put the dividers where you want. In fact if you don’t even have to use some if you’d prefer. On the top I like to keep my every day items and jewelry. It has hubby’s grandma’s rosaries, my mother’s leather bracelet, my watch and Kay’s snuza & levana movement monitors. 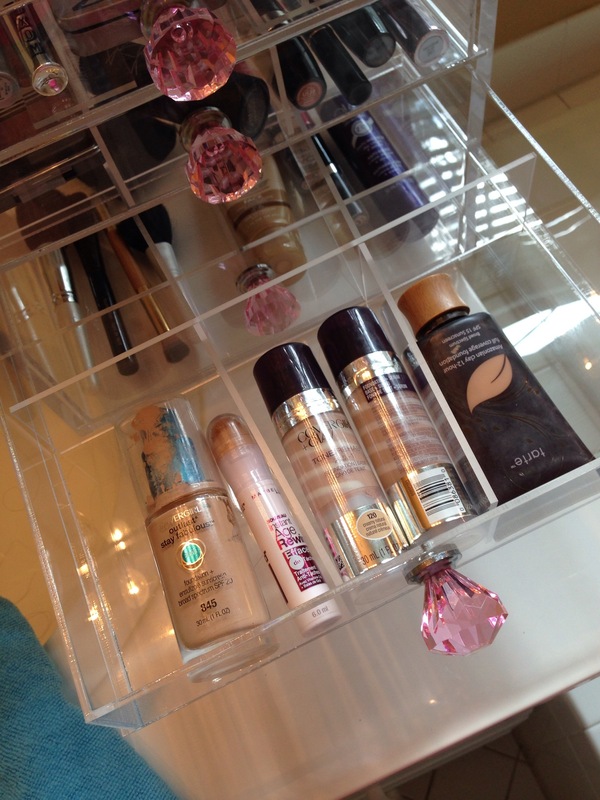 Second shelf is my concealer/coverups and bronzer. Third has my make-up brushes, eye liners, lip gloss, blush, mascara and more. Fourth comes all the our shaves and I even tossed my Earth Mama Angel Baby sample tea bags in there. Fifth has all our contacts, band-aids, nail clippers and hair ties. 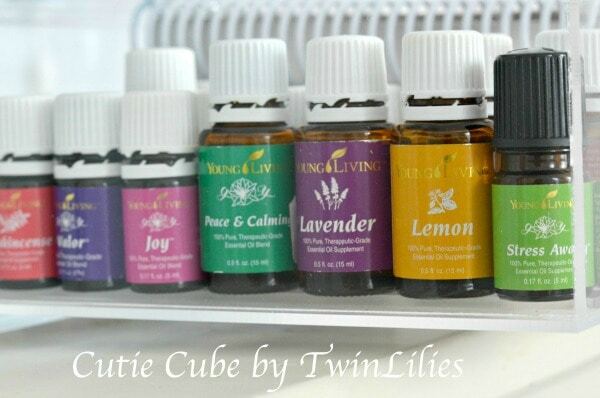 Sixth is my favorite and has all my young living essential oils!! These organizers are made right here in the USA and extremely durable. Kay yanked out one of the drawers while I was organizing it and it fell to the ground. If that was glass it would have been everywhere. Thankfully it survived without a single dent, scrape or scratch! I like to keep it in the linen closet since Kay can reach up and I have a bunch of stuff in there. One time she got to my makeup and it was about $100 in damage.. my poor bronzer never saw it coming. My aunt works at Clinque and she is going to go GAGA when she see’s my TwinLilies Cutie Cube! She still has a plastic organizer. I think she definitely needs one of these for herself! It’s for makeup and jewelry, but it really helped me store all my stuff so I think you could use it for whatever you like! 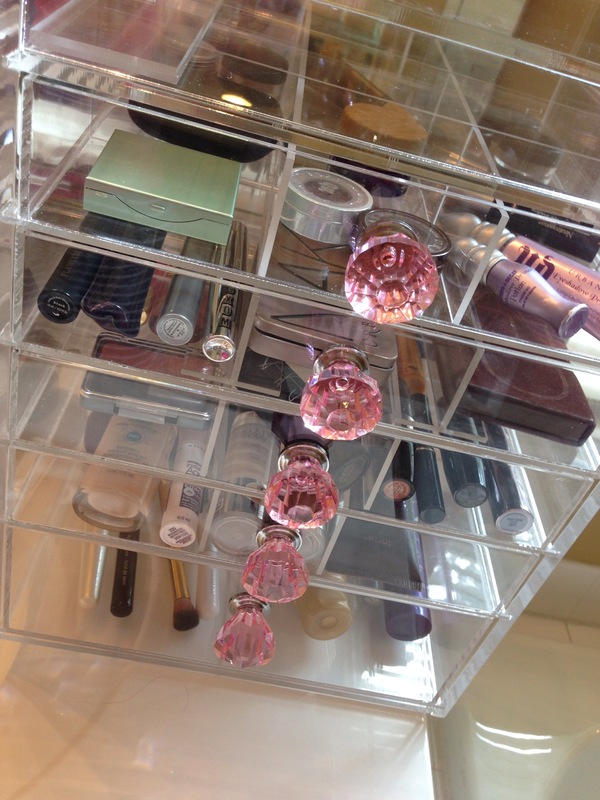 Makeup Storage and Organization is an ongoing and often an evolutionary process for me. I am constantly seeking out new solutions for a very large (too large) makeup collection. Ideally, I would just whittle my collection down so that I can fit it all into the storage solutions that I already have in place. 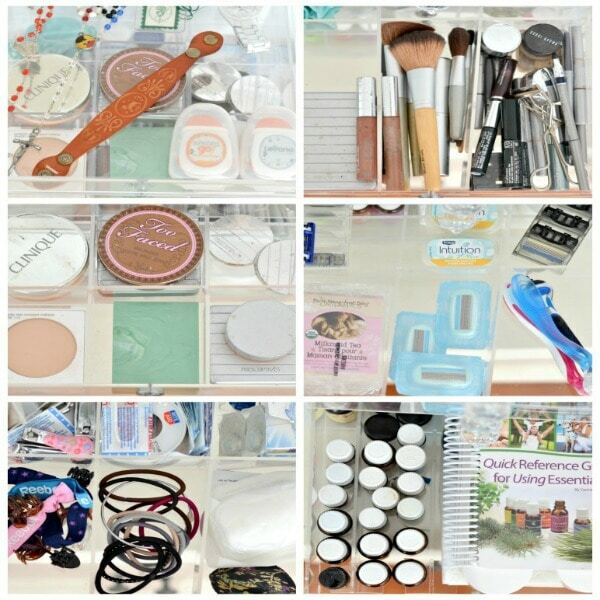 However, as a beauty blogger, I always need room for new items and items that I am testing out. While my goal still is to sort through my collection and trim it down quite a bit, in the meantime, I still seek to store it attractively! Some of you may remember from my recent Makeup Wars Storage post that I recently re-did my vanity area. 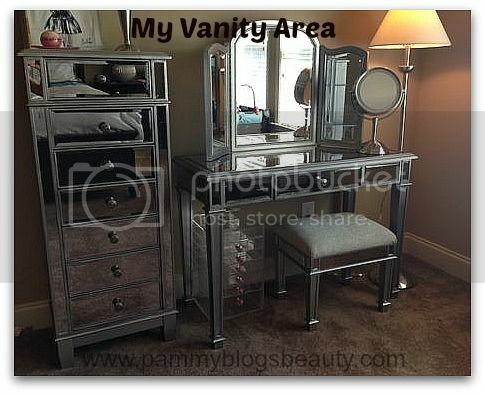 After much saving, I purchased the Hayworth Mirrored Vanity and the Hayworth Mirrored Lingerie Chest from Pier1 for my makeup area and storage. My current makeup collection now "lives" in the Hayworth Lingerie Chest. However, with acquiring new products and sampling new makeup collections for blog review, I already outgrew it! Plus, it actually is "too big" and hard to shuffle through when just looking for my everyday makeup. While I need more space for more products, I also just need a smaller unit where I can house my everyday makeup items and my new products that I am testing. I don't have much time to get ready everyday and I want to have the items that I need to use quickly accessible. 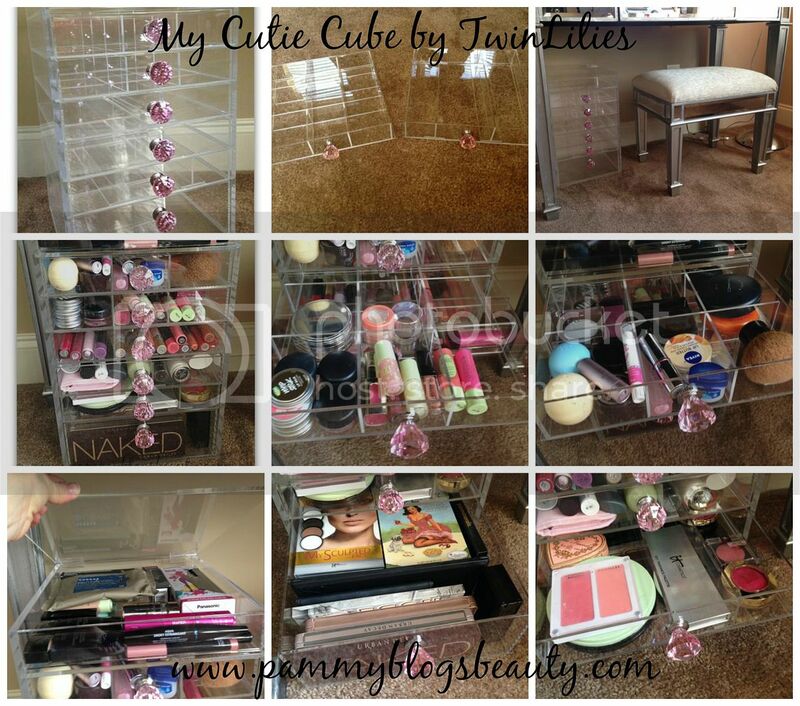 Enter the *gorgeous* acrylic Cutie Cube Luxe Makeup Storage unit from TwinLilies! This is actually exactly what I had in mind. 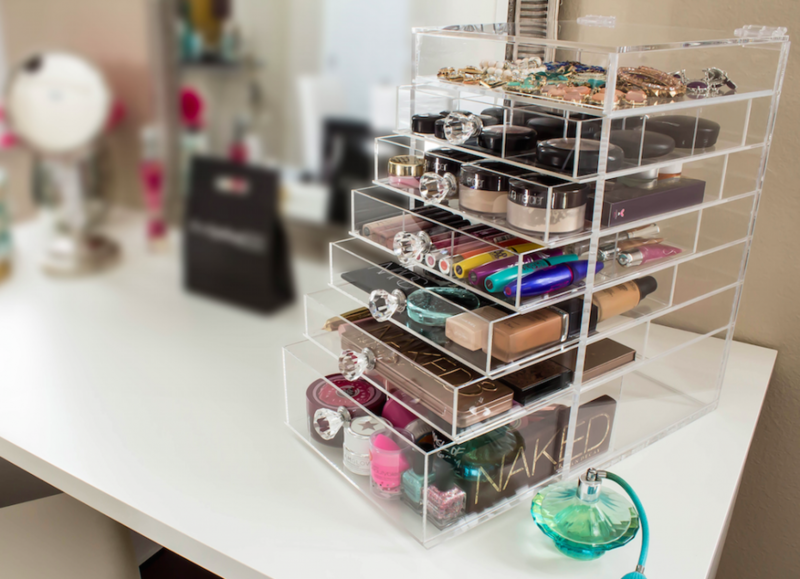 Sure there are lots of options for makeup storage out there...but, I want something elegant, functional, and attractive! My mirrored vanity and storage chest are so chic and elegant that I needed storage that would look beautiful next to/near my vanity and storage chest. The TwinLilies Cutie Cube accomplishes this for sure! To find out more details about this awesome 7-tier Acrylic "Cutie Cube" Storage Unit from TwinLilies, please click read more below. Plus, I have an awesome Coupon Code to offer my readers!!! I tried out the Large Sized cube (they have three sizes available: small, medium, and large). Also, you can pick out what kind of knobs you want for the drawer pulls. I choose pink and they are even prettier in person than they are online. Honestly, I really can't express enough how attractive this unit is. The large unit has 5 short drawers, one deep drawer (on the bottom), and a recessed space under a flip top lid (the size of the small drawers). The Cutie Cube comes with a variety of drawer dividers, too. There are interlocking grid ones that creates 9 square compartments and horizontal dividers as well to divide the drawers into halves or thirds. I love that these dividers are included! Often the issue with drawer-type makeup storage is that you need to purchase more containers to divide within the drawers...well, not with these Twin Lilies Organizers. Plus, the fact that the dividers are the same clear acrylic as the container makes the divisions look invisible and attractive. Speaking of the clear construction, can I just mention that I love that this storage unit is clear! You can easily see inside. That means no more digging through drawers to find what you need. Love it! How I organized mine: You can see by the pictures that I posted that my unit is already full, lol (I guess that makeup sorting/paring down is in my near future, right, lol!). Here is how I organized my 7 tier unit: inside the flip top are products that I am testing out for blog review. 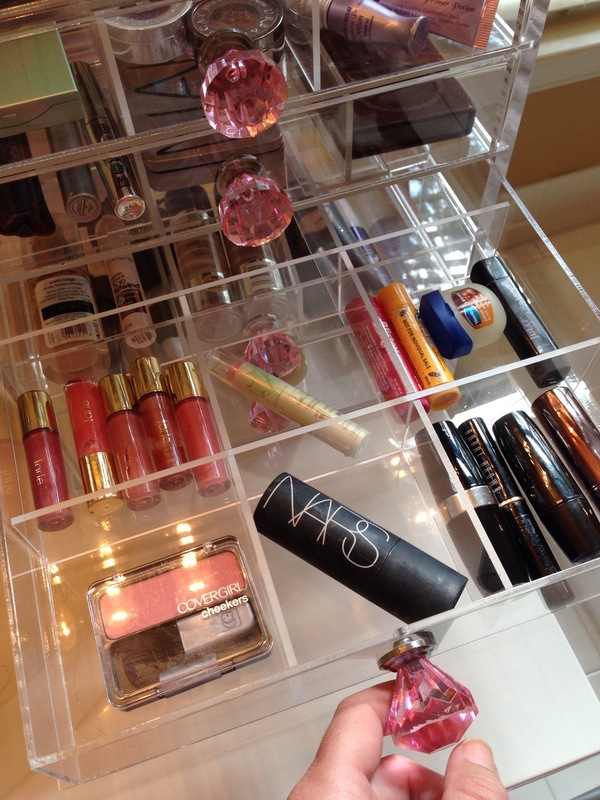 The next drawer contains everyday products like my face powders, kabuki brush, and lip balms. The 3rd drawer contains lip glosses, chubby lip pencils, and lipsticks. The 4th drawer holds primers and serums. The 5th drawer holds overflow blushes and bronzers (blushes are my favorite makeup item to "collect"...so, yes, I needed another blush drawer, lol!). Finally, the bottom large drawer holds my larger palettes. Overall, this acrylic container holds the items that I reach for on a day-to-day basis. 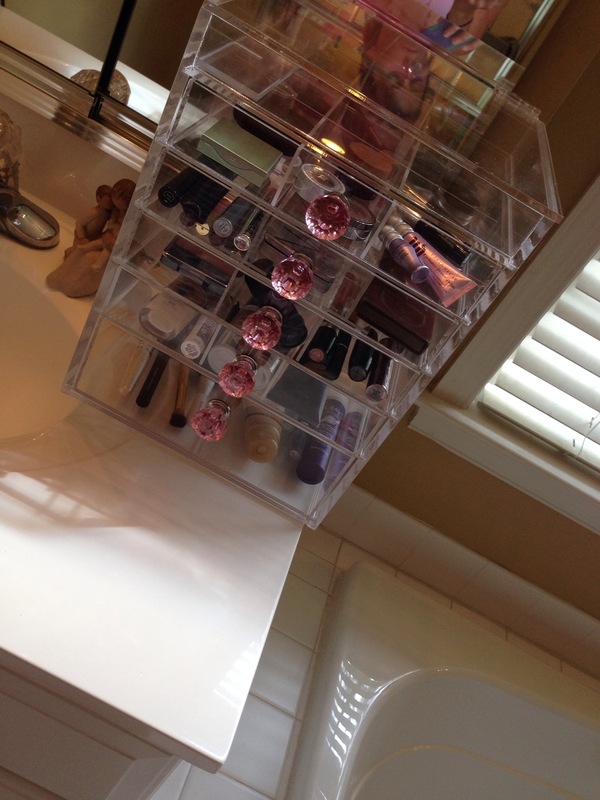 It has been so nice adding this TwinLilies Cutie Cube Acrylic Makeup Organizer to my vanity area! 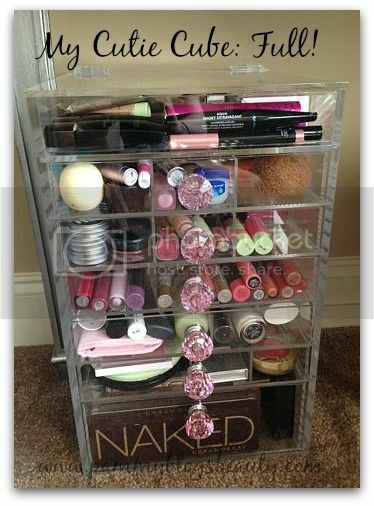 Not only is it attractive, but also it arranges my makeup neatly and is so functional and easy to access! I literally put it right under my vanity table within arms reach. I have literally shaved minutes off of my makeup routine because I am now not having to dig through my larger drawer until to find my everyday items. Now, if you have a more "normal" sized makeup collection. 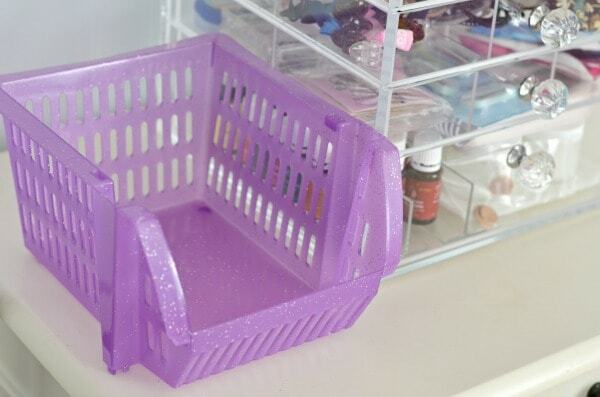 A Cutie Cube Acrylic Makeup Organizer is all you would need and you could pick the size most suited to you. These could easily sit on top of a bathroom counter as well for those of you who store and do your makeup in your bathrooms. 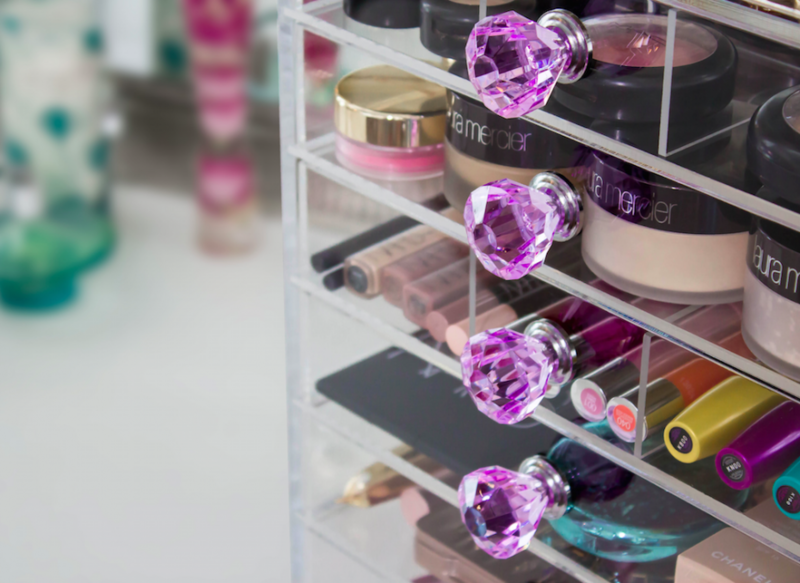 If you are looking for a top quality elegant acrylic makeup organizing unit, you should totally scope out the options from TwinLilies! I totally recommend them for both quality, looks, and function! I am absolutely thrilled with mine! Here’s how my make-up & beauty routine used to go in the mornings: out of the shower after a workout, I’m generally in a hurry because I’m a busy Mom with a crazy schedule. I was usually blow drying my hair-one handed while I did a mad dash through multiple make-up bags that sat next to my bathroom sink, trying to find the make-up I wanted for that day. It was anything but efficient. And keep in mind that I do A LOT of beauty reviews, meaning I have a lot of beauty and make-up products that were all. over. the. place. Literally. 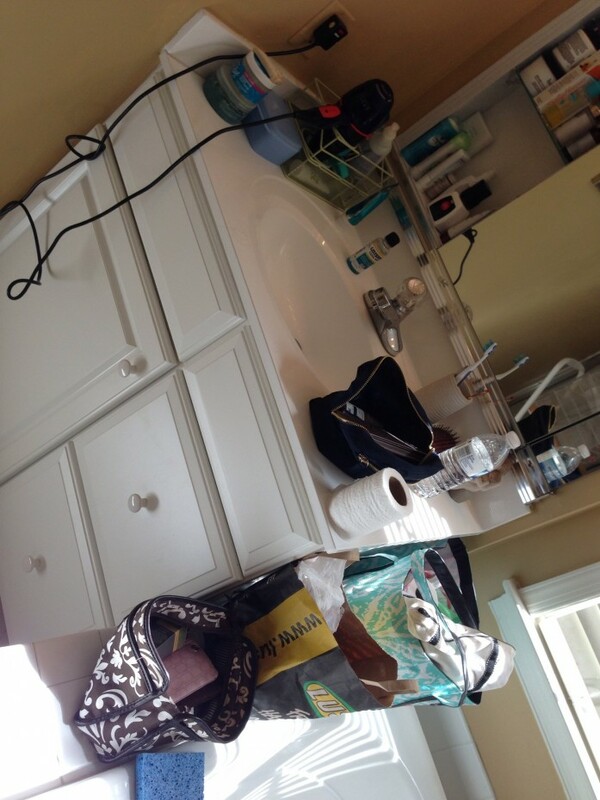 Here’s the before picture of my bathroom sick. I know, it’s awful, right? But then I received a gorgeous sample from Twin Lilies of their Cutie Cube Acrylic Makeup Organizer. I think the pictures speak louder than my words. I am so happy with my makeup & Cutie Cube organizer now. It’s amazing. Using their drawers, I have organized all of my makeup and surprise!, I found all sorts of makeup I had forgotten about. I’m actually able to now find and use different makeup depending on my day and what I’m doing. I never did this before. You can totally customize your Cutie Cube based on your needs. It comes in three different sizes – small (5-tiers), medium (6-tiers) and large (7-tiers). You can also customize your handles. I got pink but there’s pink, purple, clear and a few others! It’s just so girly and fun. It also comes with dividers so you can customize each drawer how you would like. There are suggested divider uses on the site. I found I needed something different for each drawer – lipstick’s not the same size as blush, etc! Seriously. Now these Organizers aren’t cheap (price range $249-$299) but the quality’s amazing and I think it’s worthwhile for the organization factor alone. Here’s some photos of my after – what do you think? A lot of customers have asked questions about our processes and materials, and what makes our products different from our competition. We hope this post addresses those questions and sheds some light on what we stand for. Our competitors seem to prefer to have their organizers made in China because, well, it's cheaper. But at what cost? We do things differently. All of our organizers are made right here in sunny Florida out of materials bought... you guessed it, right here in sunny Florida. Because we make all of our organizers ourselves instead of sourcing to China we have direct oversight in production meaning every organizer is produced to our quality standards, not the quality standards of some anonymous Chinese factory. It is because of these advantages that we only use cast acrylic for our products. Our competitors on the other hand often choose extruded acrylic for it's one distinct advantage, it's cheaper. The life-time of a product is a very important attribute, especially with a relatively expensive non-disposable product such as an acrylic organizer. The manufacturing processes and materials we use all extend the life of our products with the end goal of our organizers being as beautiful 10 years from now as the day you bought them. Many of our competitors use a time-saving technique of bending acrylic corners. By bent corners we mean they take a sheet and bend it at 90 degrees to produce a rounded corner. This saves on manufacturing costs, but at what price? As with most "corner-cutting" techniques, quality suffers. In order to bend acrylic you have to heat it up, making it malleable. Only once it's heated is it bendable. The issue is that the amount of heat required to bend the material also diminishes it's quality and makes it more susceptible to damage. While bent acrylic may look fine when it's first produced, it isn't until months later that small surface cracks or crazing marks will appear and spread along the area where the acrylic was heated. Because they're surface cracks it doesn't necessarily affect the functionality of the product, but it certainly looks bad. We joint every corner, a process which takes longer but yields stronger corners that won't diminish in appearance over time. Our organizers are the best quality organizer you will find for the price if not the best quality organizers you will find irregardless of price. Why some people would pay more for a Chinese made inferior product is beyond our comprehension. We take extreme pride in our products, and make sure every organizer we produce meets our quality standards. We are constantly improving our production methods and developing new products based on your feedback. Our pride is reflected in our products with a quality and value that we feel is unparalleled. That is why we believe our organizers are simply better. If you have any questions about any of the information here we're happy to answer them. Please email us at support@twinlilies.com and we'll get back to you ASAP.